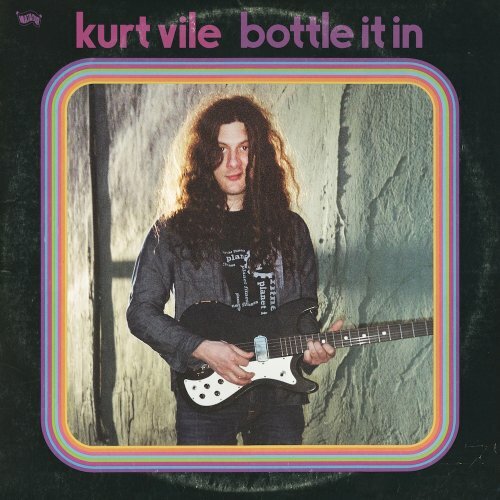 The album cover art of Kurt Vile’s latest album, Bottle It In, makes me laugh whenever I see it. Yeah, making your album cover look like a retro worn 70’s LP is a year or two past when that was the “cool” thing to do, but I can get past that because it does fit the music within. It’s the kinda dopey crooked smile Vile sports, a “Hey dude! Like, this is my record!” that makes me like the artwork. His vocals are draped in an early Tom Petty-esque lugubrious southern drawl (which is odd since he’s from Philadelphia), which only furthers the affable stoner effect once the music is cued up. Yet, Vile is smarter than he looks. There’s a lot of craft and hooky songwriting in this album. And he’s got a bit higher profile these days due to his recent collaboration with Courtney Barnett on Lotta Sea Lice. This is his seventh solo album, and back in 2005 he co-founded The War on Drugs with Adam Granduciel (though left soon after to focus on his own music.) In short, he’s been around a while and learned a few things on the way. Vile is a guitarist first and foremost and the sounds he wrests from his instrument are a joy to revel in. The twang, chime and fuzz of “Loading Zones” and “Check Baby,” the pairing of guitar and glockenspiel(?) on “Hysteria,” the way around the halfway mark in “Skinny Mini,” when the vocal gets buried in a glorious tidalwave of guitar. About those vocals: the lyrics on this album are pretty loopy in general… seemingly stream of consciousness monologues, sometimes seeming to rhyme just because Vile came up with a word that sounded like another, not necessarily because the words make any sense together. Some highlights (lowlights? ): “The little man in my head take over / Drive me man and then it drive away in a Land Rover” and “Its like mm girl, you gave me rabies / And I don’t mean maybe.” I’m not sayin’ I necessarily find this a problem with the album… sometimes it can be quite entertaining. The spooky, gothic “Cold was the Wind,” placed near the end of the album, is a return to Vile’s lo-fi roots. Along with the aforementioned “Rollin’ with the Flow” and “Come Again,” these relatively shorter songs break things up, add diversity and help keep what could have been an overly abstracted album interesting. I’m all for KV, seeing that he lives about ten miles from me. By the way, do you know if Vile is his birth surname?